ZeticaUXO provides a FREE OF CHARGE Pre-Desk-Study-Assessment (PDSA) service where we review readily available records for sources of UXO in relation to your site. We provide you with a brief summary report detailing what sources of UXO (if any) may be present and whether further more detailed desk-based assessment is required. This FREE* service is in response to our active promotion of the philosophy set out by industry guidance (CIRIA) which advocates that an initial ‘preliminary’ assessment of the UXO hazard can be made by a non-UXO specialist. The plethora of information available on the web, such as ZeticaUXO bomb risk maps, means that almost anyone can assess whether there is the potential for UXO to be present on a site and whether further more detailed research is warranted. Zetica’s PDSAs can be invaluable for this purpose, particularly for more rural areas where some sources of UXO may not be as obvious. The aim of our PDSA is not to conclude the risk level, but to instead advise whether further more detailed research is required (you cannot start suggesting risk levels based on a bomb map or two!). By using one of our PDSAs you can easily undertake a preliminary UXO assessment without paying a UXO specialist! Readily available information typically includes regional bombing statistics, bomb census maps, bombing decoy lists, historical maps and other records held in our database that might identify a potential source of UXO on your site. 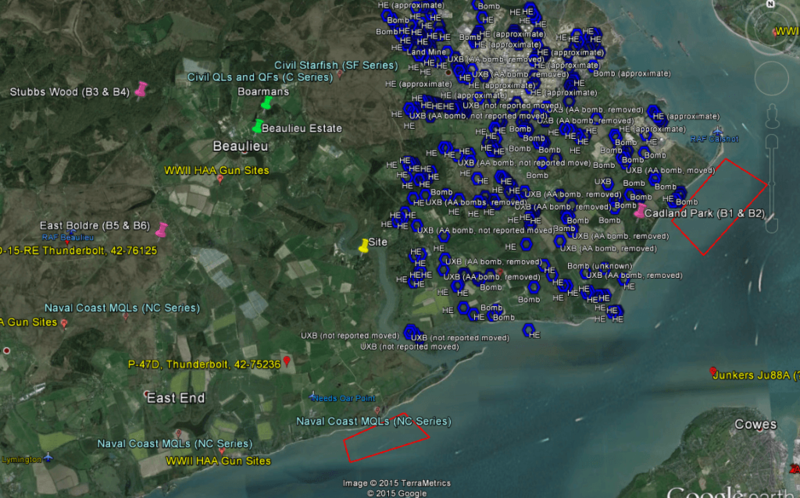 The image below is an edited extract of our database as plotted on a GoogleEarth basemap. A PDSA is typically provided within 48 hours of receiving your request. Because of our experience, database materials and objective approach, almost 70% of our PDSAs conclude that no further assessment is necessary. This saves our clients considerable amounts of time and money. If our PDSA does identify a potential source of UXO hazard on your site, you can be sure that we won’t start suggesting extensive UXO risk mitigation measures. Our objectivity is assured at all stages of our work and if the PDSA does suggest that a potential UXO hazard exists on a site, the primary task is to undertake a detailed desk study & risk assessment in order to confirm where such a hazard is likely to be present. Our PDSAs are provided in an easy-to-read table format sent via email. These can be incorporated into larger reports for those undertaking Phase 1 desk studies or alike. To view an example PDSA please click here. *Obviously these are provided free of charge subject to reasonable requests. If you want 100 sites assessed in a week, or an entire county assessed, then we will talk to you about how we can best undertake this.